Coloured etching with aquatint of St John's Church in Calcutta by Thomas Daniell (1749-1840) no.12 from his 'Views of Calcutta' published in 1788. St John's church was completed in 1787. 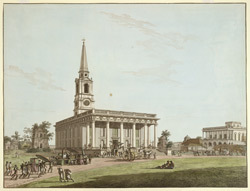 The design by Lieutenant James Agg of the Bengal Engineers was based on James Gibb's St Martin-in-the-Fields in London. Several distinguished people were buried in the churchyard seen on the left. They include Job Charnock, the founder of Calcutta who died in 1692. St John's Church was altered in 1797 and in 1811.